Last year Apple (at last) introduced a music streaming service that, for a monthly fee comparable to similar services the likes of Spotify, gives you access to millions of songs by artists big and small. For £9.99 a month, or £14.99 to allow up to five other family members to use it too, you can explore hundreds of years of musical heritage, and listen to brand-new releases on your iPad, iPhone, Mac, Windows PC and Apple Watch – as well as Apple TV and Android devices from the autumn. We’ve focussed the majority of our tips on the iPad and iPhone versions (which are almost identical) because of the popularity of accessing music on portable devices. The features we describe also apply to iTunes 12.2 on your computer, although there are a few things that are possible only on one type of device or the other. The service is about more than just giving you a massive library of music to explore at your own leisure. It also includes the Beats 1 internet radio station (which doesn’t require a subscription), and a number of genre-based radio stations (which do), as well as personalised stations that you create by selecting a song or artist that fits your mood. Just as importantly, there’s a strong focus on discovering new things to listen to – both new releases and back catalogue material that fits your tastes. Apple Music tries to do this intelligently, based on some simple guidance from you when setting it up, explicit feedback that you give it by marking things as ‘loved’, and your listening habits. Apple Music also connects you to your favourite artists in the same way you might follow them on social networks. This doesn’t require a subscription, except to add audio from their posts to your library. You might already follow artists on other networks, and right now many we’ve followed seem not to be posting to Apple Music, but in time you might find it a useful way to keep your favourite artists’ musings separate from your actual friends. Unless they are your friends. One thing that might strike you as odd about Apple Music is that it’s so separated out from the iTunes Store. You’ll need to type into a search bar to reach most of what’s in its library, yet you can add things to your personal collection, where you can rate tracks, add them to playlists, and download them to play offline just like tracks you’ve bought. You’ll frequently see a heart icon in Music and iTunes, and on your iOS device’s Lock screen and in Control Centre. It’s crucial to getting the most out of Apple Music when it comes to listening recommendations. When you first open the new Music app on iOS or iTunes 12.2 on your Mac, you’ll be invited to enrol in a three month trial of Apple Music. This requires that the Apple ID you use to sign into the iTunes Store has a bank card registered for payment, rather than just having credit on your account from iTunes gift cards, so that Apple has a means to take automatic payment for the monthly subscription past that trial period. You don’t have to take up an Apple Music subscription to keep using iTunes on your Mac, or the Music app on iOS devices, to play your previous iTunes Store purchases or music bought elsewhere. It’s also possible to hide almost all of the service’s features. If you later decide to try it out, you can make Apple Music visible in your apps once again and then go to the For You page to start your trial from there. If you have a subscription to iTunes Match, or were planning to sign up to it to make your music collection, including tracks not bought from the iTunes Store, available to download from all your devices, Apple continues to offer that annual service. Its functionality is also part of Apple Music, so if you decide the extra features of the newer service are worth the total annual cost being more than five times as expensive, you should turn off automatic renewal of Match before the end of your current subscription period in the same place you manage your Apple Music subscription. Apple Music includes the capabilities of iTunes Match, making tracks in the iTunes library on your Mac available to stream to all your devices, no matter where those tracks came from. It does this by first matching tracks to those available in Apple’s library, and secondly uploading any it can’t match to your iCloud Music Library. All of those tracks are then available to play on all of your devices, but there’s still a 25,000-track limit on the latter type, just like in iTunes Match. Eddy Cue, Apple’s Senior Vice President of Internet Software and Services, recently tweeted that Apple is working to increase this number to 100,000 tracks by the launch of iOS 9 later this year. Tunes will prompt you about a three-month Apple Music trial. If you don’t accept right away, click For You at the top of the Music view later on. Otherwise, click the button that starts the sign-up process, then choose an individual or a family membership (the latter requires Family Sharing to be set up, but this is pretty simple too). You’ll be asked to accept Apple’s latest terms and conditions and confirm the purchase of a membership plan, as signing up for the trial enables recurring payment at the end of it. If your Apple ID is part of a family and you aren’t its organiser, an Ask to Buy request will be sent to them. Click once on the circles of genres you like, twice on those you love, or put the pointer over those you dislike and click the cross that appears. Your choices influence the artists suggested when you click Next. Repeat the process, clicking More Artists if necessary, after which you can click Done. he New and For You pages are key to finding new music. The former shows new releases, and is worth checking out from time to time. The New page has numerous categories for you to explore, some of which are persistently featured, while others are timed to major events in the music industry calendar. It works well as a summary, but with so much scrolling and tapping and no guarantee that you’ll find anything you like, discovering music this way can feel like a lot of work. However, tap the Curator Playlists banner to find collections from well-known music publications. The For You page should more quickly guide you to suitable sounds, old and new, because its contents evolve in response to information you feed back to Apple. It draws on what you’ve said you love (by tapping the heart icon next to a track, album or one of Apple’s playlists) and by what you listen to. The page suggests specific albums and curated playlists, such as introductions to artists, but it doesn’t cross-reference the former with what you own. We’ve found that we already own as many as half of the albums listed on the page. You can provide negative feedback to influence future recommendations by holding your finger on an item and choosing I Don’t Like This Suggestion. This works for albums and playlists on iPhone, but strangely only for albums on iPad, and the capability is missing entirely on the Mac. The Connect page is a place for you to read, watch and listen to updates posted by your favourite music industry people. The app will have followed artists whose music you’ve previously bought from the iTunes Store. You’ll probably want to review that list to unfollow some artists. Artists can post photos, videos and songs to Connect. For songs, this might be stuff that’s available to stream, or demos and unreleased tracks. Below each post are three icons. The heart expresses to the artist that you like their update. Tap the speech bubble for personalised feedback, and to read other people’s. The third is iOS’s familiar Share icon. Every comment shows a person’s name and, if you like, a unique nickname. Set these by tapping the account icon (top-left), the top row, then the fields for your details. You can also add a profile picture. Scroll down past the station anchors and other details that are also presented in the Music app and you’ll find a listing of forthcoming guest presenters. Scroll down the Beats 1 page in iOS’s Music app to find featured shows. Tap one of these shows and you’ll be shown a list of previous episodes. They’re labelled as playlists because you can’t listen to the whole show with presenter commentary, but you can see what the presenter played and add their entire playlist or cool individual tracks you discover to your music library for easy access in future. Further down the Radio page you’ll find a selection of themed and genre-oriented stations that play continuous mixes. These are a good way to revisit classics you might have forgotten about, and to discover new things. When listening to these stations or Beats 1, remember that you can send feedback to Apple about tracks they play, just like you would for tracks you find by searching manually or in the New or For You pages; use the heart icon in the Now Playing view (on iOS) or at the top-right of iTunes’ status area, or use the More Options button if you want to add a track to your music library without it influencing future suggestions. We’ve found it useful to create at least one playlist with a name like ‘Music from Radio’ and add individual tracks to it. This still adds them to your library, but it gives you a consolidated list of all those one-offs you might later want to remove from your library. There is one more type of station, and it gives you more direct influence over the kinds of things it plays. Use the More Options button next to an item, or in iOS’s Mini Player or iTunes’ status area (when you place the pointer over it), and you’ll find an option to start a station. (iTunes provides two options: New Station from Artist and New Station from Song). This tells Apple to use that song as the basis for a station that plays a continuous mix of other tunes that Apple’s analysis of people’s listening habits suggests will go well with your choice. Unlike Genius Playlists, these stations play tracks from Apple’s library rather than your own, which makes them a good way to match your mood while also hearing a mix of the familiar and stuff that’s new to you. When listening to a personalised station, the playback controls include a star icon. Open Up Next and you’ll see that it doesn’t show much. That’s because at any time you can influence future songs the station will play by using the other options behind the star button. Restrictions on iOS and turn off Apple Music Connect, or iTunes > Preferences > Parental on a Mac to disable the feature. 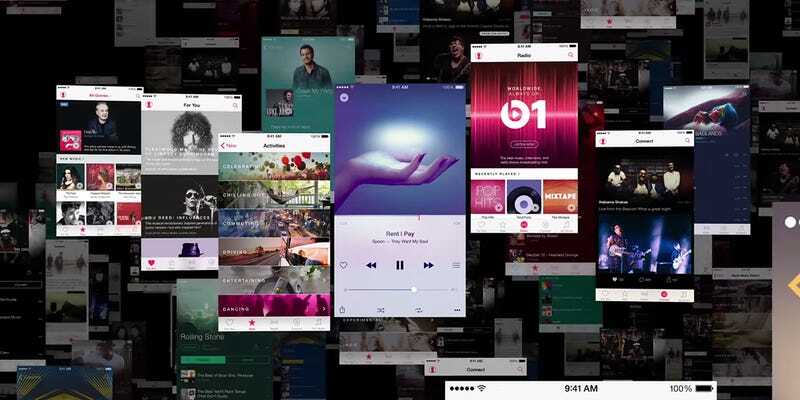 You’re still left with the Radio tab because you can listen to Beats 1 without a subscription. However, the other radio features, other curated stations and the ability to create your own stations using an artist or a track as an indication – require a subscription in most countries.